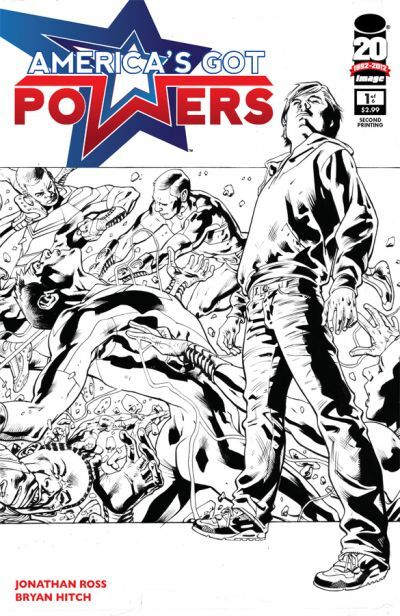 The first issue of Image Comics’ AMERICA’S GOT POWERS, by TV personality and comic book scribe Jonathan Ross (TURF) and the legendary artist Bryan Hitch (The Authority, The Ultimates), has sold out at the distributor level. The first issue of this colorful new hit series that combines the entertainment world’s make-or-break reality show zeitgeist with the colorful, action-packed superhero genre is already being reprinted to meet demand. The second printing (FEB128169) will be on shelves May 9th, with AMERICA’S GOT POWERS #2 following just one week after on May 16th. AMERICA’S GOT POWERS is the story of the most successful TV show on Earth, a reality show of super-powered proportions. In AMERICA’S GOT POWERS, a generation of super-powered teens struggle to prove their worth while the whole world watches.